Postural Orthostatic Tachycardia Syndrome (POTS) is a chronic health condition that is characterised by a large increase in heart rate (30 bpm) upon standing. Other symptoms include dizziness, nausea and fatigue which are usually relieved when lying down. The severity of symptoms varies from person to person. Those with mild symptoms are usually able to continue with their normal day-to-day activities, whereas those with severe symptoms may not be able to work at all. Around 80% of those with POTS are female and initial onset of symptoms can occur at any age. POTS is a form of dysautonomia (a dysfunction of the nervous system) and is usually diagnosed using a tilt table test, but it can also be diagnosed with an active stand test. 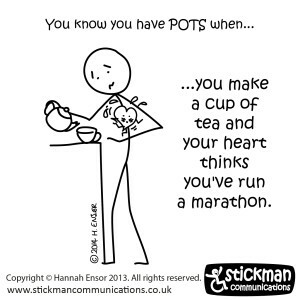 The average diagnosis time for POTS is 5-6 years, but can be diagnosed within 6 months of the first onset of symptoms. POTS has been regarded as a physical illness since the early 90’s, but it is often misdiagnosed as anxiety. As POTS affects each person differently, there are many treatments options available. If you suspect that you have POTS, consult your doctor.